Carmel-by-the-Sea has a special appeal in the early hours before the main shops open on Ocean Avenue at 10:00 am. On most days a silent fog covers the village and muffles the morning sounds, creating the calm, peaceful impression of being held in a soft blanket by the town. In these hours it is easy to see how so many painters and craftspeople found inspiration in this former artist enclave on the edge of the Pacific Ocean between Los Angeles and San Francisco. From the top of Ocean Avenue a gentle slope of art galleries, high-end retail shops and hidden eateries invites you down to Carmel’s elegant beach. Find a seat for brunch on the outdoor patio at Katy’s Place on Mission Street by 9:30 to avoid the crowds. Bring cash to cover The Katy Combo (approximately $20 per person) as this small local favorite doesn’t accept credit. The Katy Combo comes with eggs, bacon and a stack of Katy’s mysteriously tasty sand dollar pancakes, which satisfy with a sweet twist of flavor. After breakfast, take advantage of the morning by picking up a café mocha to-go from The Carmel Coffee House located down a narrow alley past The Club Next Door, then head out to explore the shops as they open. If you traveled with a pet or are a dog lover, peer in the windows of Diggidy Dog Pet Boutique on the southwest corner of Mission Street and Ocean Avenue and admire the designer dog and cat attire and bakery of treats. 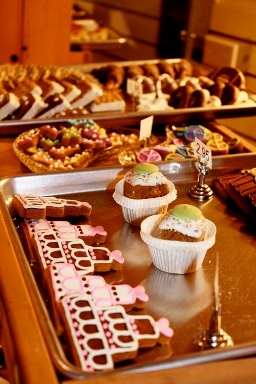 These come at couture prices, but the staff generously greets canine visitors with free treats. Just as the fog bank begins its daily journey out to sea the streets will fill with chatty pedestrians and helpless cars slowing to make way for tourists. Avoid getting overwhelmed by ducking into The Cheese Shop and enjoy samples of international cheeses and wines. On most days the owner can be seen attracting large groups of listeners as he details individual cheeses and the reasons each one is the best, as well as humorously correcting common mispronunciations. Once you’ve had your fill of wine and cheese, venture over to Bruno’s Market & Deli on Junipero Street for a picnic you can take to the beach. A half pound of sliced tri-tip meat, a baguette and a selection of locally-made Lula’s Chocolates make for an affordable midday meal for two. Choose a bottle with a screw-off top from the selection of local wines and a couple of plastic cups; this will allow you to enjoy your time on the beach with ease. If you’re lucky enough to be in Carmel on a Wednesday night in the summer months, return here for Kona Jerry’s barbeque, which Bruno’s hosts just inside their doors. At the barbeque station you can get pork ribs and chicken roasted with Hawaiian flare and listen to Kona Jerry himself discuss his passion for delicious foods. 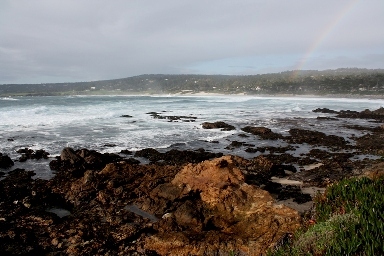 To fully enjoy Carmel Beach’s unique atmosphere, find a cozy spot past 12th Street in one of the many rolling coves and soak up the views of the world famous Pebble Beach Golf Course along with multitudes of happy surfers catching waves and pups roaming off their leashes. Once the sun settles behind the horizon and the fog begins to roll over the town again, finish off your evening with a trip to Mundaka’s, a modern Spanish tapas bar with an intimate setting and cheap sangria. As you return to your bed, you can feel confident that you’ve experienced the best of local fare in Carmel-by-the-Sea without emptying your pocketbook.